That's such a cool idea with the bell pepper. Great way to get the monster kids to eat veg! JDaniel and I love the pepper. He might not eat the pepper, but it is so cute! How cute the pepper is. It is all cute. I have seen oranges cut into a pumpkin face and then used as a fruit cup. Best Muffin Tin ever! I just love the pepper pumpkin. Very clever! Your pumpkin pepper is cute. Happy Halloween Lisa. (and no, I don't think I need to worry about HBP during pregnancy.) lol. Very very cute! What great ideas! I am sure it was gobbled up! 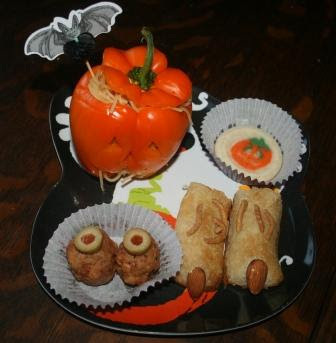 That has to be the cutest Halloween lunch I have ever seen! Absolutely adorable! I love the pepper idea! And the fingers are very cool too. I've been wanting to make those. Oh, and bell pepper is sooo good for you too! Great idea to get a child to eat! Love the pepper and the breadstick fingers. Love the bell pepper idea! Did your kids actually eat the bell pepper? My girls just gave your pics a HUGE thumbs up! I hope you made one for you too! That is serious fun right there! i wish i had done this when my boys were little. so creative and fun, you rocked this one!! Very creative! My favorite is the meatball eyes. Oh this is just so adorable! Love that pepper!! love your muffin tin! that bell pepper is so awesome! Can't wait to try out the bell pepper idea. We love peppers here and the kiddos would love that! 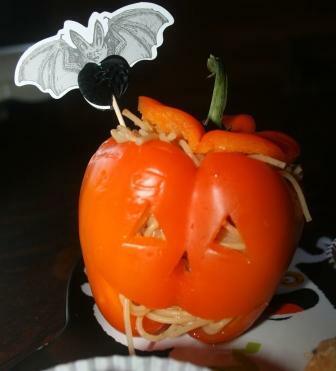 Super cute pepper-jack-o-lantern with spaghetti. My DH would like this. He is such a kid at heart! That's very cool - I love the capsicum Jack-o-Lantern! Love your bell pepper idea! That is about the cutest thing ever. This idea is just too too great. Not just to get them to eat their veggies, but to be able to carve "pumpkins" year-round. Love this so much.